Google Street View has a new option to show photos uploaded to the Google-owned Panoramio. 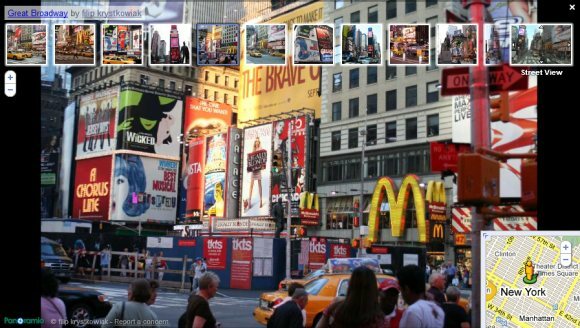 "Now you can browse user-contributed photos that have been precisely-matched to Street View images. Gorgeous photos from Panoramio allow you to see some of the world's most famous landmarks at an even closer level," explains Google. Whenever you visit in Street View a location that has user-contributed photos, you can click on one of the photos for a different perspective. You'll find many Panoramio photos for popular places like Tour Eiffel, Duomo di Milano or Times Square. I wonder if you can upload photos to Panoramio and have them posted to offer street view in places that the Google Streetview mobiles haven't been. I doubt it but that would be really nice. It's too bad that Panoramio doesn't offer any upload API. They don't read all the IPTC/XMP metadata when you upload so it's a pain. I also didn't see any way to opt out of their API that allows other sites to show your photos. Any idea how they mapped the perspectives? Well it certainly seems nice, but what about the over all privacy, street view images have been edited to hide people's faces, and licence plates, but with the addition of user photos, now there are images that contain people's faces, and licence plates. I'm sure there will be a lot of complaints about the privacy of other peoples faces, specially since the only way to report a concern, is with Panoramio itself, and not Google, who is posting this images on Google Maps. Panoramio is a photo sharing site like Flickr, Picasa Web Albums etc. The person who uploads a photo is supposed to own the copyright for that image and Panoramio is only licensed to host and distribute the file. Why would Google remove faces and license plates from some photos it doesn't own? Panoramio photos have already been available in the image layer of Google Maps or when you search for a location (e.g. : London). They're also included in a Google Earth layer. Panoramio has a TOS and a flagging feature that address your concerns. Very nice Article! Two thumbs up! Privacy is an issue here but photo releases are not. You don't need a photo release to photograph someone in public and then publish the photo on a web site. My understanding is that a photo release would apply if the image were being used to sell something. I'm sure there will be a lot of complaints about the privacy of other peoples faces, specially since the only way to report a concern, is with Panoramio itself, and not Google, who is posting this images on Google Maps. @viv energy drink: It's a lost battle, Google is posting the images saying that since the pictures are publicly online, then they are able to post the pictures on Google Maps, and if people have a concern, then they can report it to the original domain where the pictures are stored. Hi, great site! Really cool info you have here. I also made a blog that tells you which photo editor options/settings to use in order to enhance your photos and keep them looking natural. The specific settings (values) are listed so everything should be clear. This is for free photo editors like Picnik or Pixlr or others that I also list – you don’t need to install it or register to use it. If you’re interested feel free to also try to enhance your photos and please let me know how that worked for you – you can leave comments in my blog. It did a good job for most of my photos (not all) so I wonder how it will work for other people’s photos. Nice feature from google indeed I am saying Google should be careful of what pictures get posted on Google Maps. Even thought the people that post the pictures on Panoramio own the rights, the pictures contain faces of people that the photographer most likely did not get a photo release from those people, since they were passing by on the street.